Well, we are officially in the second half of the year and we have a bunch of new smartphones to look forward to. It seems Samsung will be first to kick the new season off, with a Samsung Unpacked event on the 9th of August. And we know what we will get to see — the reiteration of the Note line in the form of Samsung Galaxy Note 9. Of course, as can be expected, the new super phablet will come with a bunch of upgrades over the last version. Samsung's Note line has always been known to push the envelope and pack as much of the latest tech as it can fit. The S Pen is pretty much unrivaled when it comes to smartphone styli. It uses Wacom technology, it comes with the phone that has a special slot holder for it, it feels very natural to use and the software has features to complement its use. Now, it seems the S Pen is about to get a major upgrade — Bluetooth connectivity. Leaksters have hinted towards this and a recent FCC listing pretty much spilled the beans that the S Pen will have Bluetooth LE connectivity. Why? Nobody knows exactly what it would do, though sensible speculation suggests the ability to control media playback as well as use it like a remote shutter button for the camera. Ever since the Note 7 fiasco, Samsung dialed it back a bit in terms of trying to stuff massive batteries in tiny, tiny smartphones. The Note 8 had a 3,300 mAh, which sounds respectable, but didn't really sate the powerusers' hunger. Now, rumors say that the Note 9 might have a 4,000 mAh battery, which certainly sounds like a nice, big upgrade. And hey, if the new S Pen needs a constant Bluetooth LE connection, that battery bump might come in handy! Is it really possible? The jury is still out. That S Pen slot on the phone does take a lot of space. The Galaxy S8 had a 3,500 mAh battery, yet the Note 8 needed a downgrade to 3,300 mAh, presumably because of room restrictions. If the Note 9 makes the sudden jump to 4,000 mAh, that'd be some impressive engineering! Up until the Galaxy Note 4, the Note line was synonymous with ridiculously powerful hardware. It always had more memory than the Galaxy S flagship of the same year — some called it overkill, power users called it perfection. Since the Note 5, Samsung's top-tier phablets have always had the same hardware as their equivalent Galaxy S flagship for the same year, which kind of took some of the line's flair away. 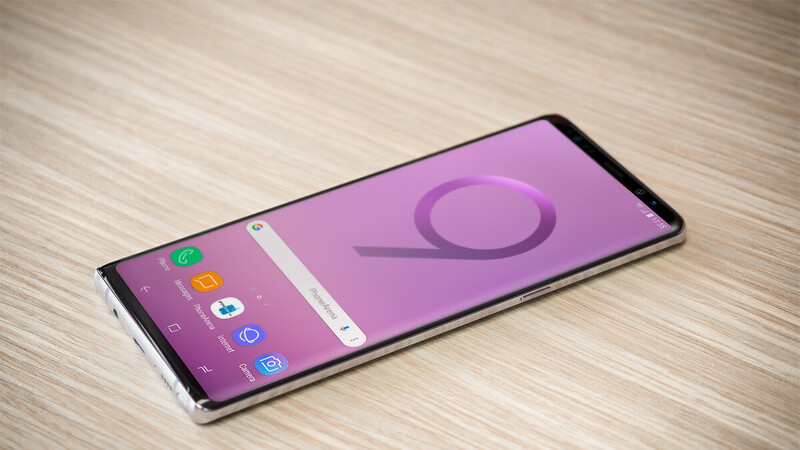 According to some rumors, the Galaxy Note 9 might have a version with 8 GB of RAM and 512 GB of storage. Dialing it back up to overkill, we see! Unfortunately, this edition of the device may be limited to a few markets only. Of course, the Note 9 will have the new tech that the Galaxy S9 brought about. This includes the variable aperture, which swaps between F1.5 and F2.4 to better adapt to daylight or nighttime shots. While we are on the topic of Galaxy S9 tech — the Note 9 will certainly also have the blood pressure sensor that Sammy tested with the S9. We tried it on the flagship a few months ago — while not 100% accurate, it's an OK feature for casual readings. Earlier, rumors (and wishful thinking) suggested that Samsung will finally have under-the-glass fingerprint readers ready for prime time and installed on the Galaxy Note 9. If that were to be true, it'd mean that the fingerprint scanner pad will move away from its awkward position on the back of the phone and would get the classic fingerprint scanner on the front. However, in recent months, these reports have slowly died down and slowly, but surely, the sense that this is not happening is seeping in. Now, we expect the Note 9 to have a horizontal camera setup with a fingerprint pad underneath (not to the side, thankfully). Of course, there's always the hope that Samsung might just surprise us. That's all the new features we know or have heard of up until this point. Of course, with the Note 9's reveal coming up, we will be keeping our ear to the ground for any other juicy tidbits. Agree For note 5 users the upgrade will be big. For note 8 buyers it will be just above a minor upgared but all phones now days are just minor upgrades from the last year's model. What about for iPhone 7 Plus users? Cough me? Will be a huge upgrade for you. Nothing minor about 4000 mAh battery! I'm using note 3 for 4.5 yrs....will get a j7 pro for the time being n then get note 9 as soon as it launches.